Learn everything ukulele—from chord progressions to playing pop, folk, and holiday favorites—and, yes, even Hawaiian music! The ukulele is hot. The season one finale of Glee featured a ukulele. The recent hit song "Hey Soul Sister" by Train includes the dulcet tones of a uke. Not to mention the runaway success of the Ukulele Orchestra of Great Britain. For anyone wishing to master this fun, surprisingly versatile instrument, Ukulele For Dummies covers all the basics—from chords and strumming patterns to guidance on finger-picking. 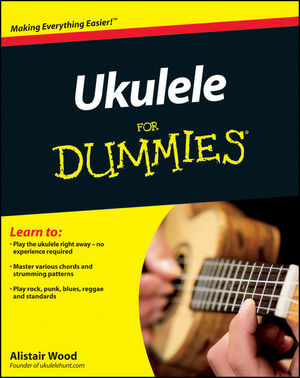 With its simple and clear instruction, and inspiration on every page, Ukulele For Dummies will have fans and first-time musicians making beautiful music—as they tiptoe through the tulips—in no time. Alistair Wood is a ukulele player, transcriber, arranger and the owner of ukulelehunt.com, one of the most popular ukulele sites on the Internet.